"Wake up, Ramon!" That was my call at 6.30am in the morning. Peter Deveraux woke me up, I had a shower and he gave me some corn flakes for breakfast. Today's surprise was a special gift from Peter. He did not allow me to leave Hervey Bay, without actually having stayed one night on Fraser Island. "So I arranged a barge, a bus tour and a night in the resort, and a return ticket for tomorrow," he said. He personally paid for it all. At 7.30 I was packed and ready to get onboard of the bus that picked me up, straight at the front door. This was the bus of Fraser Venture Tours who was going to take me and some other passengers to the barge that would take me up to the island. I was curious of what I would happen today, as I already did a daytour on the Island last Monday. "When I read that you went on a day tour from Noosa, I had already booked everything for you," Peter told me, "So I hope you still want to go�"
"Of course, Peter! I feel honoured." After the half an hour trip to the island, all the passengers for the Venture Tours-bus climbed into this big air-conditioned 4x4 bus and we hit the sandy roads. "If I say that we leave at 1.15, I leave at exactly 1.15. So that means that the wheels are rolling at 1.15. Does everybody understand this?!" The mature school class of mostly backpackers that I seemed to be part of mumbled Yes. I don't like drivers who are a tourguide and have a way of behaving like this. We drove straight from the west part of the island to Seventy Five Mile Beach on the east part and high-speeded over the beach-highway again with some 100km/hr. Meanwhile the driver was telling us the interesting information about the rainforest and the temperate forest we just passed, about the strong and dangerous currents in the ocean, the traffic rules on the beach, the weather for the coming days, etcetera. We first drove up the beach all the way and had a quick stop at Cathedral Beach, where the coloured sand dunes have shapes that resembles the shape of a cathedral, according to the locals. I mainly saw washed away dunes, if you ask me. You decide. From Cathedral Beach we drove back and had a quick stop at the Maheno shipwreck. The Maheno was once a luxury liner, which when on route to Japan for scraping was washed ashore on the eastern beach of Fraser Island during a rare winter cyclone in 1935. Honestly I was more impressed by the Cherry Venture wreck that I saw this weak on Rainbow Beach, not much was left of the Maheno at this moment. And the thing I had been looking out for was Eli Creek. 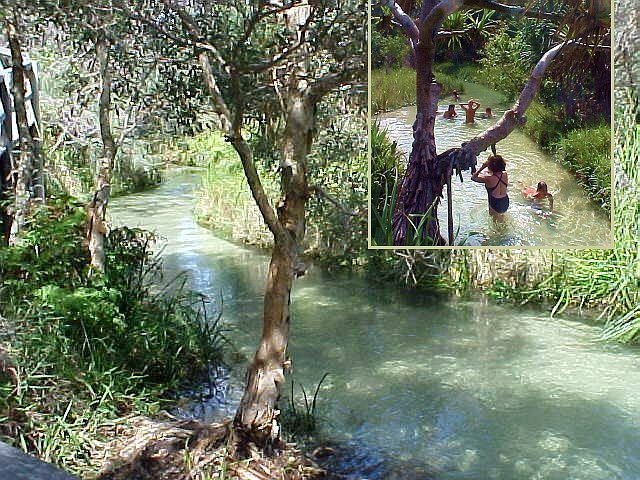 Eli Creek is the largest of the freshwater streams flowing into the ocean and looses some 4 million litres of water every day. Eli is popular with all the visitors and a walkway allowed everybody to appreciate its beauty. We stopped for a bare twenty minutes so we could run up and float down at least a couple of times. That was thrilling! Right in the middle of a rainforest you can jump in this super clear fresh water creek � just a bit chilly � and it flows me straight towards the end at the beach. Just like that! Naturally! Almost air-dried I stepped back in the bus again. We were ready for lunch and were taken to the Eurong Beach Resort, the place I passed earlier last week and I wrote "How. Can. You. Do. This? I asked Peter, the driver if Eurong was short for You Are Wrong." Actually, I was going to stay here the night today. Peter had arranged that I could do half of the day tour today and hop off the bus after lunch at Eurong, then check into my room, spend the rest of the day here and continue the day tour (going back off the island) tomorrow after lunch. "That is the only way I could let you stay on that island, as no other transport was available, unless you have your own 4x4," Peter had told me. When everybody was standing in a big line for this lunch in the restaurant building, I got my backpack and stuff and checked in at the reception. Wow, were those ladies friendly! They kindly asked me to another man in the restaurant to get information about my room � thinking I was a backpacker from some sort of tour operator. Back at the desk again, I told them again "I have a booked room." Someway they were probably not used to young people with an enormous backpack staying in their so-called Korawinga Units, the self contained motel units with double beds and a lounge and a kitchenette. I was given the key for my room 101 and explained where everything on this resort was. The restaurant was behind me, the beach bar behind another building and the shop is down this street. "Enjoy!" she said and finally sends me a smile. I dropped my bags in the nice and airy room and headed back to the restaurant for that promised lunch (part of the tour). It was a plate with salad with fried chicken or fish, filled up with two variations of pasta. When I finished this lunch, the bus had already continued the rest of its tour and I was ready to explore the area. Dozens of 4x4 trucks were parked around the local shop, as this was the only place on the island where you can fuel your car and do some shopping. And who were there? The ex-Noosa-lodge-Brit-girls-room-mates Sarah and Lisa! They were on a 4x4-mission along the island and were going to stay here in tents for a few days. "Are you staying here?" Lisa asked. "What an miserable looking place." I looked back at the resort surrounded by this temperate rainforest and close to the sea. It sure looked like it does not belong here. I walked around the shop (walking on the beach is dangerous because of all the high-speeding traffic) and discovered the big two-storey beach bar. I had to remember this one for tonight. I passed all the other units on the resort, varying from apartments, cottages and cabins for backpackers (everything was empty as far as I could see) and saw the swimming pool (empty). I walked a small circle on the resort grounds and discovered I could not get away anywhere. You are advised not to walk into the rainforest and not to walk on the beach. It was hot and I got back to my room and had an afternoon nap. When I woke up again, it was already 7pm. The sun had set and my stomach was thunderous. I guess that meant: dinnertime! Peter had handed me some money, which would be way enough to get me around for a dinner, breakfast and lunch and a deposit for the room. When I arrived at the fully bright-lit restaurant I became very sad. On little tables were couples sitting who seemed to get the last out of their marriages or were going to divorce tomorrow. The only sounds were made by the barman (pouring glasses) and an overexcited waiter who served the tables. Nothing else. It was like I had ended up in a scene of a Stephen King movie. I ordered a VB beer at the bar and looked around. The average age was 35-plus. I guess I lost my backpacking school class of this morning in the bus. The waiter came up to me and I asked for a table for one person. "You are not in the tour group?" he asked. "Which tour group? No � I have a room." It was like I was the first person ever to come here who comes independent and wants a room. The man ran around for a few seconds and then started to work on a small table in the corner. "Here sir, your table," he announced to the entire restaurant. I got today's menu, which was Soup with an attitude and Pasta in a spicy tomatosauce. To me everything had an attitude at this resort, except the food. The soup had complete tomatoes in it and the pasta was just pasta with sauce. I could barely eat it, but finished half of it anyway. I just felt guilty towards Peter. This whole deal cost me 25 dollars. What a rip-off! But with at least a full stomach I walked in the darkness towards this beach bar behind the shop. To my disappointment nothing was going on here. Okay, it might have been early, it was only 9pm. Again here bright light lit up everything and a big bar guarding waiter said a silent Hey to me. Nope, this wasn't the right spot for the right time, I guessed. Back at my room I turned on the TV and followed a report about the collapse of the New York Twin Towers. It was on the only channel with clear vision, but still did not want to watch that. I ended up sitting at the bar, typing some new reports on my laptop. At 11.30pm I walked back to the beach bar again, hoping there would be some more life out there. The complete darkness made me conclude that the beach bar was already closed. From this point I was hoping it would already be tomorrow afternoon, when the day tour bus would pick me up and take me along again, off the island. I don't know what it was, but something just kept on crawling up my back, into my mind. What was it? Peter had paid for this stay on the island, even gave me some pocket money to survive and I was feeling trapped. Enclosed. There was nothing. Those thoughts made me feel guilty again towards Peter. 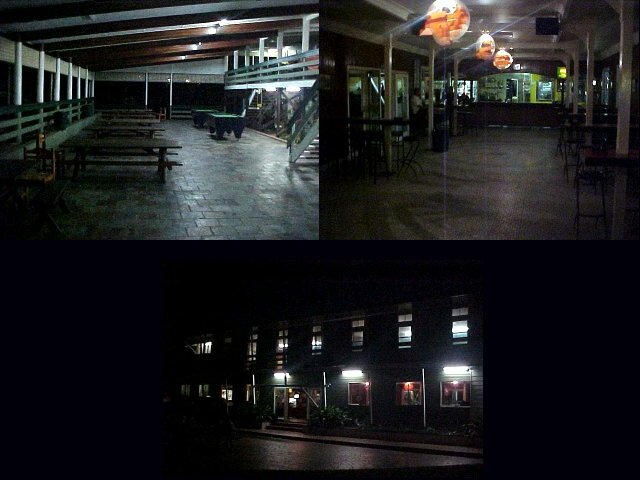 This entire Eurong Beach Resort was just very depressing to me. Just let married couples divorce here or let older folks decide to die here, but it was no place for me!